I can't believe this is the last of the Rice Krispies Challenge! I'm actually SAD. It has been such an awesome and fun experience teaming up with 3 other awesome mom bloggers in Philadelphia this year challenging ourselves in making fun recipes with Rice Krispies as the main ingredient. Each challege we rotated to a different team leaders house. And this time around we were at Tara's, my rockstar mom friend with Moms On The Spot. Unfortunately, I hadn't seen Tara in FOREVER. And this was the first time I had seen her absolutely GORGEOUS new house! Anyway, she was a super awesome hostess with the mostess as we took on the challenge for the winter holidays. We decided to go for the 'simple' yet most rewarding idea with the Christmas Krispy Kountdown. Simple, yes. Rewarding? YES!!! 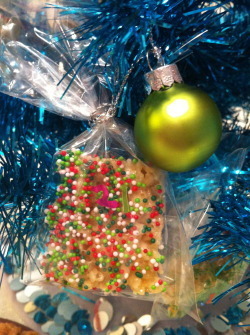 Our special recipe is Gingerbread Spice Rice Krispies. We cut them in squares then covered them in different kind of sprinkles. We put them in tiny holiday gift bags with a date on them and tied them up with adorable ornaments before hanging them on the tree. And LUCKY Isabella, Tara's daughter gets to eat one of these tasty treats everyday leading up to Christmas! 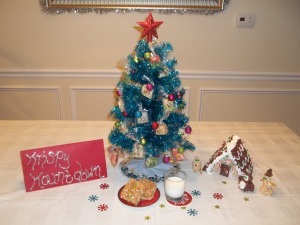 This can really make a special holiday tradition in your house!! Ok-Now with the details. Here is the recipe for the treats. 1. In large saucepan melt butter completely over low heat. 2. Stir in gingerbread spice. Add marshmallows and stir consistantly until creamy. 3. Turn off heat. Mix in Rice Krispies until they are fully coated with marshmallow mixture. Lay out onto a wax paper lined baking sheet. Cool and cut into small squares. 4. Press on sprinkles of different colors and place squares in numbered bags. Tie with bag tie and loop small ornament around top of bag and hang on tree. 1. Comment below with your favorite family tradition for the holidays..
Abbreviated Rules: No Purchase Necessary. Begins no earlier than 12:00:00 AM (ET) on 11/22/11 and ends no later than 11:59:59 PM (ET) on 12/18/11. For complete Official Rules, go to ( http://web.mediacdt.com/docs/BloggerRulesHalloween.pdf ). Open to legal residents of the fifty (50) United States and District of Columbia who are 18 years of age or older at time of entry. Subject to complete Official Rules. Void where prohibited. Sponsor: The Motherhood; www.TheMotherhood.com. Additional participating blogs can be found listed on The Motherhood for more chances to win! CONGRATULATIONS TO JENNIFER AUER! Jennifer's favorite family tradition is driving around the neighborhood to see the lights. They have one house with lights that dance to the music! Awesome! Thank you all for participating in our Rice Krispies challenge.